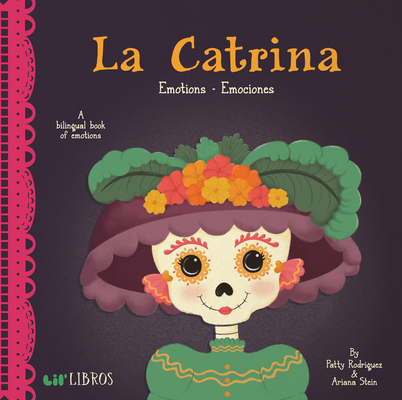 Inspired by one of the most recognized symbols of Dia De los Muertos (Day of the Dead), this book introduces little ones to emotional expressions and their first English and Spanish words--and teaches them to recognize feelings like emocionado (excited), triste (sad), and confiado (confident). Unable to find bilingual first concept books she could enjoy reading to her baby, Patty Rodriguez came up with the idea behind Lil' Libros. Patty and her work have been featured in the Los Angeles Times, Rolling Stone, CNN Latino, Latina Magazine, Cosmopolitan, People En Espanol, Cosmo Latina, and American Latino TV, to name a few. She is currently Sr. Producer for On Air With Ryan Seacrest-iHeartMedia, jewelry designer for MALA by Patty Rodriguez, and creator of Manolos And Tacos.